Ryōanji is a temple located in north Kyoto, Japan affiliated with a branch of Zen Buddhism. The followers of Zen Buddhism pursued “enlightenment” or “awakening” by means of self-introspection and personal experience in daily life. 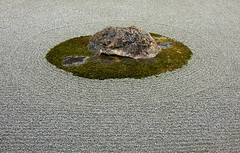 The quintessence and aesthetics of Zen is epitomized in the rock garden and architecture of Ryōanji. 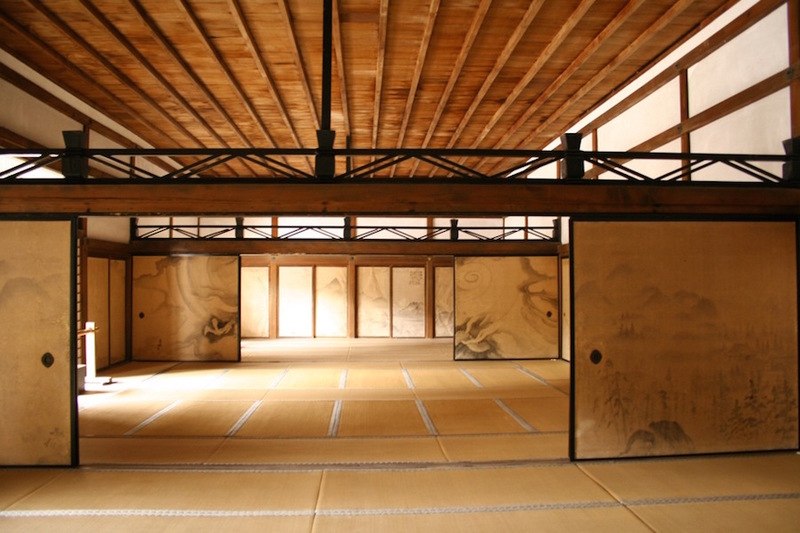 Ryōanji thrived as a great Zen center for the cultural activities of the elite from the late sixteenth through the first half of the seventeenth century under the patronage of the Hosokawa family. 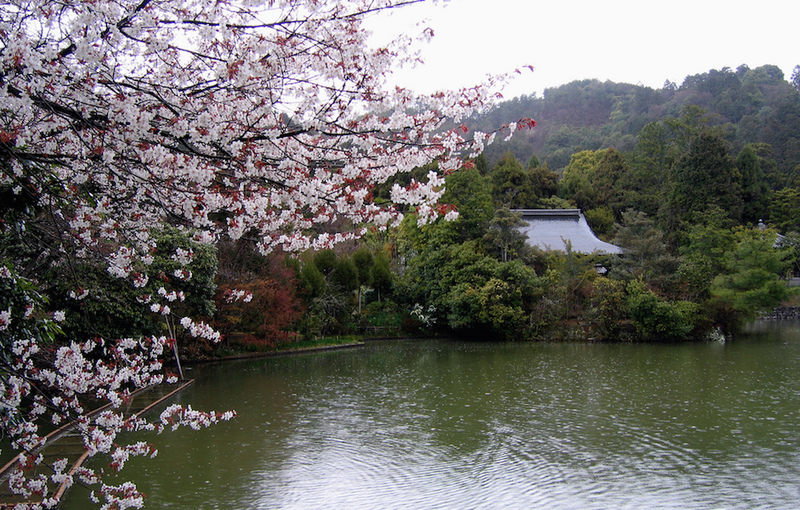 The temple and its gardens are listed as one of the Historic Monuments of Ancient Kyoto. 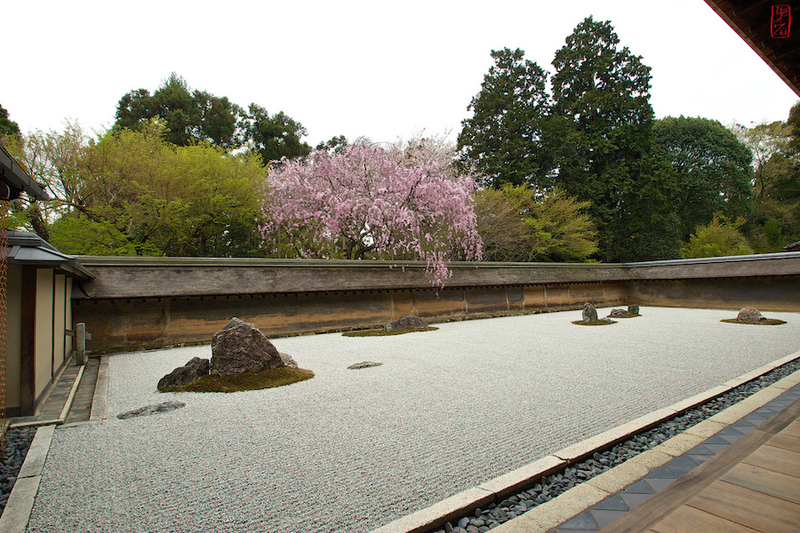 In the late 1990, the garden attracted over a million visitors annually and is regarded as an expression of Zen art and a symbol of Zen Buddhism and Japanese culture. When visitors pass through main gate, they encounter the Mirror Pond (Kyōyōchi) on the left with a scenic view of surrounding mountains. 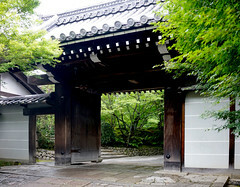 Walking along the pilgrim’s path and entering the second gate, visitors arrive at the main building of the monastery, the hōjo (abbot’s residence). The rock garden is located in the front of the hojo and is viewed either from the wooden veranda embracing the building or from inside the room. What is Zen Buddhism? 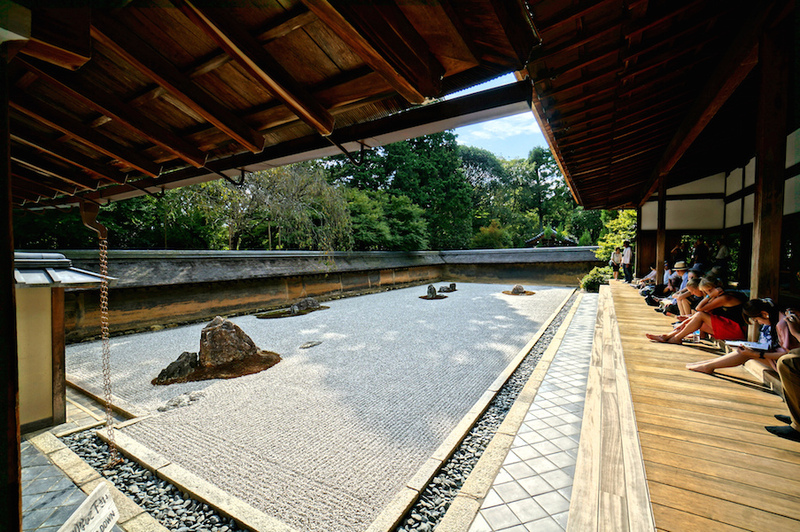 The Ryōanji garden is the one of the most famous examples of a rock garden—a form which developed during the Moromachi period (1392-1573) with the efflorescence of Zen Buddhism in medieval Japan. 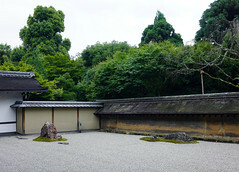 This type of garden consists of rocks and pebbles rather than vegetation and water, and was mainly created on the grounds of temples for encouraging contemplation. White gravel often symbolizes flowing elements such as waterfalls, rivers, creeks, or sea, while rocks suggest islands, shores, or bridges. The garden may have been inspired by aspects of both Japanese and Chinese culture. For instance, Shinto, an indigenous religion of Japan, focuses on the worship of deities in nature. Also, Zen Buddhism, which derived from Chan Buddhism in China, emphasizes meditation as a path toward enlightenment. Medieval Chinese landscape paintings associated with this sect of Buddhism often displayed a sparse, monochromatic style that reflected a spontaneous approach to enlightenment (see the example, left). Together, these concepts promoted the aesthetic values of rustic simplicity, spontaneity, and truth to materials that came to characterize Zen art. 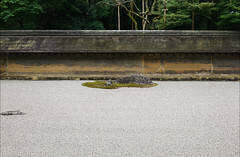 Today, the sea of gravel, rocks, and moss of the rock garden and the earthy tones of the clay walls contrast with the blossoming foliage beyond—evoking stillness and contemplation suitable for meditation. 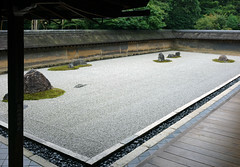 Like other Japanese rock gardens, the Ryōanji garden presents stones surrounded by raked white gravel with a minimal use of plants. 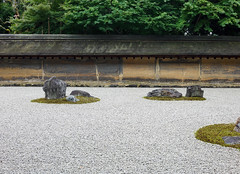 Fifteen rocks of different sizes are carefully arranged in groups amidst the raked pebbles covering a 250 square-meter rectangle of ground. 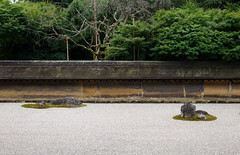 The stones are carefully arranged so that one can only see no more than fourteen of the fifteen at once from any angle. Staring from the largest group on the far left, a visitor’s eyes rhythmically move through the garden from the front to the rear and back, and then from the front to the right upper corner. The garden is located on the south side of the hōjō, the main building used for the abbot’s personal study and living quarters. 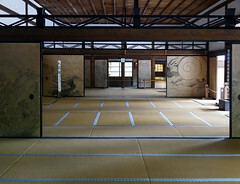 The hōjō is divided into six rooms by sliding doors called fusuma; three rooms on the south (a reception, a lecture room and a meeting room) and those on the north (a study, a changing room and a central room consisting of three subdivisions of a serving chamber, alter, and sleeping room). 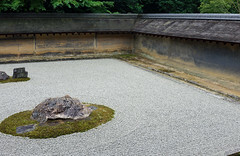 The hōjō also includes gardens on each side of the building—a moss garden called the West Garden, a stone and moss garden, and a garden with a tea house. 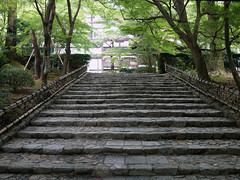 Scholars debate the exact dating of the garden, but the consensus is that it was originally created in the fifteenth century and that its present design dates from the Edo period ( (1615–1868). The identity of the garden’s creator is also controversial, as no records of the rock garden can be found prior to the early 1680s. Early descriptions explain that the garden has nine big stones representing “tiger cubs crossing the water” and attribute the design to Matsumoto, the chief patron of Ryōanji, or Sōami, the connoisseur, painter, and garden designer attending the Ashikaga shogunate. An inscription carved on the back of one stone bears witness to the involvement of professional laborers in the garden’s architecture—the stone has two names, Kotaro and Hikojiro, who were known as sensui kawaramono (riverbank workers) belonging to the lower social strata. As the garden has fifteen stones today, it is certain that the arrangement we see now cannot be the same as the original medieval design (which had nine stones). Although it remains unclear who designed the garden, or what it originally looked like, it is evident that the Ryōanji garden has changed throughout time. 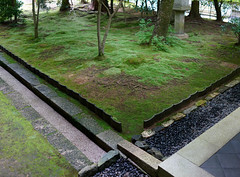 Many different theories on the garden’s meaning have been suggested—some say it represents islands floating on an ocean, or a mother tiger carrying cubs over the sea, while others say it symbolizes the Japanese aesthetic concept of wabi (refined austerity) and sabi (subdued taste), or the fundamental ideal of Zen philosophy. A more recent theory argues that it is an expression of a pure form of abstract composition meant to incite meditation. Whether originally intended to represent pictorial images or symbolize metaphysical concepts, it is certain that the rustic austerity and minimalist rock garden at Ryōanji has played a significant role in art and architecture from medieval times to the present in Japan. The fame of the stone garden at Ryōanji is so imposing that it has overwhelmed the other parts of the temple, including Kyōyōchi (Mirror Pond, located in the lower part of the site), a small west garden, and a rear garden with a teahouse. The Mirror Pond is reminiscent of courtly gardens from the Heian period (794 to 1185), while the teahouse and garden date back to the seventh century. 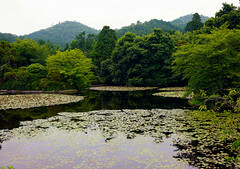 Near the teahouse is a famous stone water basin. 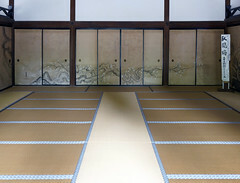 The wall door paintings that once decorated the hōjō are preserved today in Japanese and overseas collections. Among them, two large panels depicting “Chinese Immortals” and the “Four Elegant Accomplishments” (above) belonged to Ryōanji’s main hall and once faced its rock garden. They were removed from Ryōanji and sold in 1895, when Buddhism was persecuted during the new Meiji regime. These works entered the collection of the Metropolitan Museum of Art in 1989. Contrary to the austere monochrome ink paintings of landscapes and bird-and-flower paintings decorating the abbot’s quarters in Zen temples dating from the Muromachi period, they depict Chinese narrative themes rendered with extravagant colors on golden backgrounds. This permits a glimpse into a radical shift in the interior program of the Zen monastery during the late Momoyama and early Edo periods, led by the rise of samurai warlords as prominent patrons of art and formidable political entities. Recent scholars criticize the romanticized notion of Zen art and culture as a symbol of Japanese aesthetic—pointing out that this interpretation is largely a product of the twentieth century, fueled by growing nationalism in Japan. 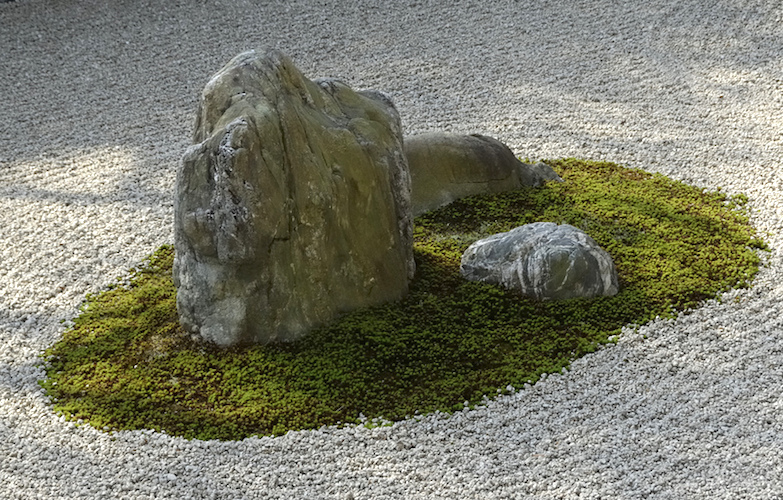 Furthermore, Zen Buddhism was disseminated in the West and filtered through modernist artists, who were fascinated by the minimalistic perspectives and abstracted forms of Japanese rock gardens. 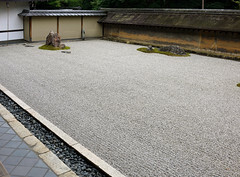 Whatever the skepticism one reserves for existing assumptions about the Zen garden and culture, no one can deny the cultural and historical significance of Ryōanji and its rock garden. François Berthier and Graham Parkes, Reading Zen in the Rocks: the Japanese Dry Landscape Garden (Chicago, Ill: University of Chicago Press, 2000). Kendall H. Brown and David M. Cobb, Quiet Beauty: Japanese Gardens of North America (Tokyo: Tuttle Publishing, 2013). Wybe Kuitert, Themes in the History of Japanese Garden Art (Honolulu: University of Hawai’i Press, 2002). Hiroshi Onish, “Immortals and Sages: Paintings from Ryoanji Temple,” The Metropolitan Museum of Art Bulletin, v. 51, no. 1 (Summer, 1993). Cite this page as: Dr. Yoonjung Seo, "Ryōanji (Peaceful Dragon Temple)," in Smarthistory, September 18, 2016, accessed April 18, 2019, https://smarthistory.org/ryoanji-peaceful-dragon-temple/.